Early morning at Glen Canyon Dam, Courtesy Autodesk/BOR. These aren’t scenes from an action film, however. 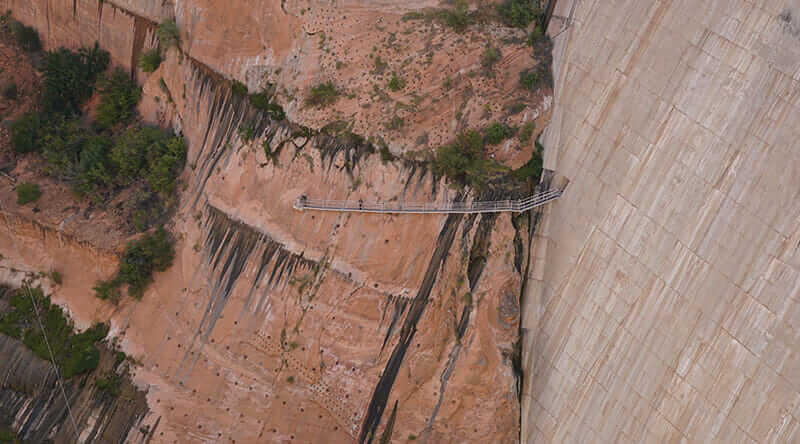 They’re real-life events from the Colorado River near Page, Arizona, where an ambitious project is underway to create a 3D digital model of Glen Canyon Dam, one of the world’s largest concrete dams. iPhone panorama of the High Flow Experiment (HFE) at Glen Canyon Dam. Courtesy Autodesk/BOR. Although its script called for many stunts, the hero in this story isn’t Tom Cruise, Jackie Chan, or The Rock. It’s the Bureau of Reclamation. Part of the US Department of the Interior, the Bureau of Reclamation—Reclamation for short—was established in 1902 to stimulate economic development in the West by providing water to its arid states. It built and continues to manage over 8,000 miles of irrigation canals, 337 reservoirs, 492 dams, and 53 hydroelectric power plants that supply more than 31 million people with 10 trillion gallons of water and 40 billion kilowatt hours of electricity every year. In the western United States, where water is scarce and flooding common, Reclamation’s infrastructure is vital. Unfortunately, it’s also aging. In fact, the average age of the country’s 90,580 dams is 56 years—many are even older. What began as a mission to provide water to the population of the West is now a mission to save it. Without proper maintenance, infrastructure that was once an asset could become a liability. The Glen Canyon Dam is designated national critical infrastructure, and the protection and maintenance of it is taken seriously. But there are also 57,000 large dams around the world that need maintenance or overhauling, including 23,000 in China and many throughout the United States, Japan, Brazil, India, and Europe. Case in point: California’s 49-year-old Oroville Dam. In February, damage was discovered on its main and emergency spillways. After years of climate change–induced drought, an intense rainy season caused a sharp rise in Lake Oroville’s water levels above the dam. Dam operators released water into the spillways to relieve pressure from the dam so it wouldn’t break. But the surging water quickly eroded the spillways. Fearing rapid erosion that would send a deluge of water into surrounding communities when the spillways eventually failed, authorities evacuated 188,000 people for three days until they were sure the spillways would hold. Months later, repairs are underway, but risk remains. iPhone panorama of the upstream (or Lake Powell) side of Glen Canyon Dam. Courtesy Autodesk/BOR. To avoid a similar calamity at 54-year-old Glen Canyon Dam, Reclamation is creating a 3D digital model of the dam and its hydropower plant. “Because this dam was built in the 1950s and early ’60s, it was done without computers,” Winslow says. 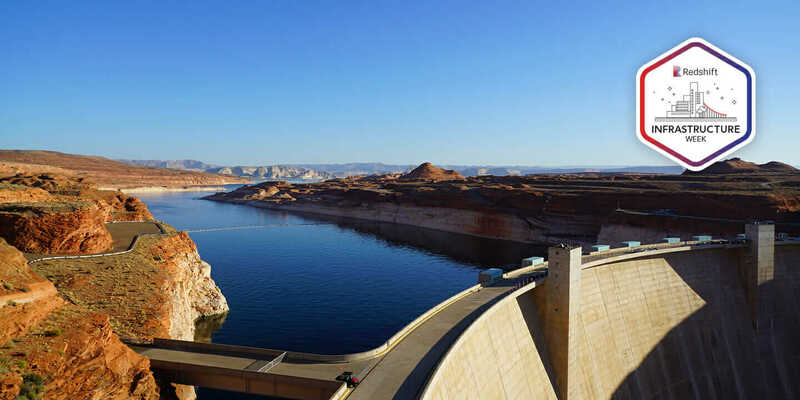 Reclamation has approximately 10,000 hand-drafted drawings of Glen Canyon Dam—a good reference for understanding the facility’s composition but less valuable for managers seeking to understand the current and future state of the entire facility. Cracks naturally form in concrete dams, just as in concrete sidewalks. Two decades ago, Reclamation began exploring 3D modeling. Reclamation theorized it would help document cracks, determine their sources, and repair them. Winslow, who combed every inch of the facility—even elevator shafts, which he spelunked like caves—documented cracks on a rudimentary model created with AutoCAD Map 3D. It was a good start, but still just a start. 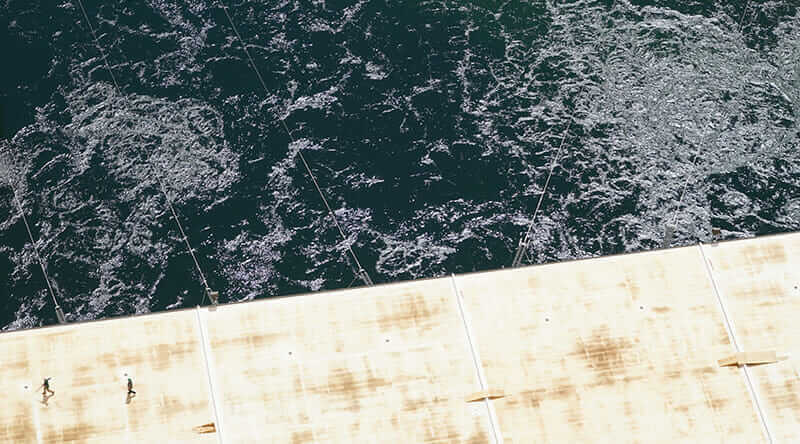 When Winslow received funding to finally create the model in 2015, the first step was thoroughly laser-scanning the dam and hydropower plant—a massive undertaking that started in August 2016 in partnership with Autodesk. Unlike a room or object, which can be scanned in minutes or hours with minimal equipment, scanning a massive piece of critical infrastructure takes days and heaps of cutting-edge technology. And, frankly, chutzpah. The process took two weeks and produced 700 separate scans. 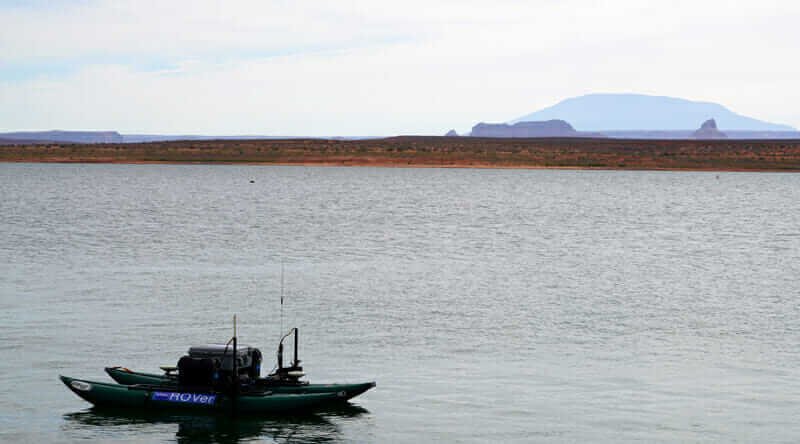 Upstream, where the dam impounds beneath the Colorado River, a remotely operated vehicle (ROV) used sonar to capture the dam’s underwater surfaces. 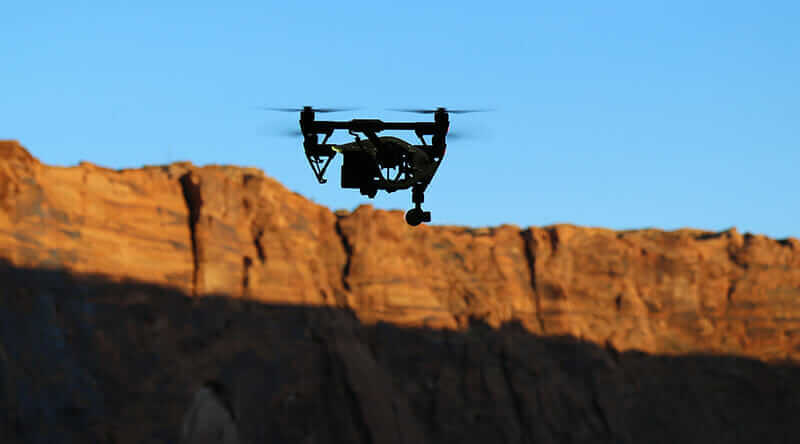 Downstream, airborne photogrammetry was collected with a medevac helicopter, and side-scan sonar with a remotely operated vehicle (ROV). The team even leveraged a drone to scan the interior of the hydropower plant’s main generating room, where ceilings soar to 50 feet. David Dreffs (Autodesk) and Dave Winslow (BOR) laser scanning at Glen Canyon Dam. Courtesy Autodesk/BOR. UAS flight near the power plant at Glen Canyon Dam. Courtesy Autodesk/BOR. David Dreffs (Autodesk) and Dave Winslow (BOR) laser scanning on the powerplant roof at Glen Canyon Dam. Courtesy Autodesk/BOR. Sonar ROV testing at Glen Canyon Dam. Courtesy Autodesk/BOR. 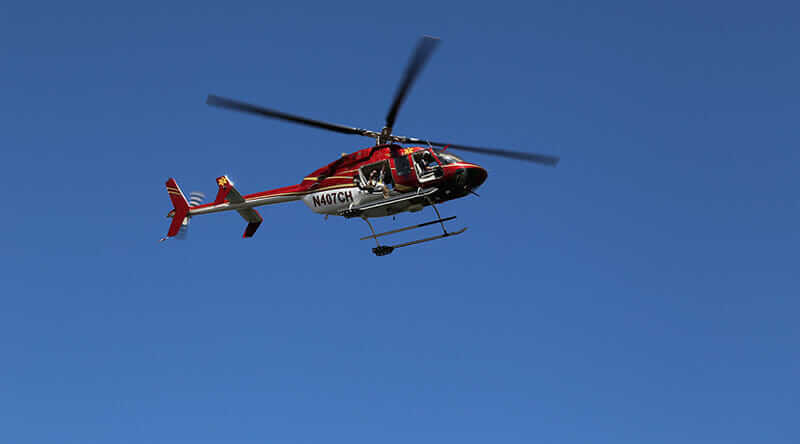 Pete Kelsey and Rama Dunayevich (Autodesk) conducting helicopter-based photo modeling at Glen Canyon Dam. Courtesy Autodesk/BOR. These scans produced a collection of photorealistic point clouds that were subsequently merged using ReCap Pro. The merged point cloud was then imported into Revit to produce a Building Information Model (BIM) that Reclamation can use to optimize the technical design of mechanical, electrical, and control systems in need of upgrades or replacement. This fall, the Revit model will be imported into InfraWorks to create a dynamic model for nontechnical users to visualize the facility, monitor its health, and predict its future performance. The dam’s facilities manager will be able to use the model to monitor the physical premises. Its maintenance personnel can use it to diagnose mechanical and electrical problems. First responders can act more quickly if someone is injured deep inside the dam. It can also be used to create a 3D-printed model for educational purposes. The Big Dipper over Glen Canyon Dam during the High Flow Experiment (HFE). Courtesy Autodesk/BOR. Perhaps the most important beneficiaries, however, will be future Americans, as the model will make it easier for Reclamation to observe trends and forecast the impact of climate change. The resulting earlier and better maintenance will ensure a lasting water supply for Western states, while preventing the kind of crisis unfolding at Oroville Dam. It’s such a promising idea that Reclamation plans to model other dams in the future, including Nevada’s Hoover Dam and Washington’s Grand Coulee Dam. It’s also currently using digital modeling to help solve other problems in its purview, like habitat restoration.